The Leap is a refined watch with a sophisticated look that subtly combines aesthetics and elegance. In the spirit of delaCour, the curves of the elliptical shaped case, hallmark of the brand, are accentuated on the Leap thus making this timepiece soft and sensual like a woman’s silhouette. This timepiece features all delaCour codes, namely the elongated horns that are specific to the brand. Its pink gold case set with diamonds holds a magnificent diamond dial comparable to a flawless snowy carpet. The dial is embellished with emeralds, blue or pink sapphires, making it shine at all time. The leap Snow is equipped with a quartz movement especially destined to women who like to change their watches. The watch is completed with a hand-stitched crocodile strap matching the color of the stones. The Leap Snow pays tribute to the beauty of women, dedicating this collection of sensually curved timepieces inspired by the female silhouette. Introduced in 2007, this new and unique shape, that combines the square and the circle, is embellished with three new dials that enliven the model revised and launched in 2016 with a thinned watch case. The Saqra watch is a unique timepiece with a strong character, a bold design, away from stereotypes and standards. It is the perfect balance between the smoothness of the circle and the audacity of the quadrilateral. Its case, thinned since 2016 in this new version, makes it very comfortable to wear and dresses admirably the wrist. 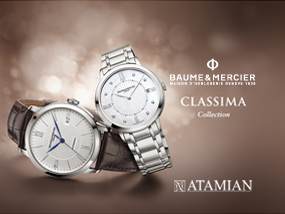 The watch is distinguished by a typed and elegant design, which demonstrates that its owner is different. The new dials are therefore offered in a white, gray and blue version, which add to the black dial launched in 2016. The dial is fragmented by horizontal lines along its length, giving it a more contemporary style and a sensation of relief on the plate, highlighting in that manner the strong particularity of the Maison deLaCour that composes out of the ordinary dials. These are an undeniable part of its DNA. The appliques of trapezoidal shape, treated in Super Luminova, remain unchanged and the process of the different hues on the watch plate is carried out by hand in an artisanal way. The date window remains at 3 o’clock. A sapphire crystal on the back of the case reveals a glimpse of the self-winding movement. Once again, deLaCour proudly presents a new special series of curvy and feminine jewelry timepieces: The Promess Glamour. This timepiece features all delaCour’s codes; namely the folded horns, the “turbine-type” crown and the iconic strafed bezel. Thanks to its imposing and offbeat originality, the Promess Glamour is a watch that will leave no one indifferent. A very colorful collection: bright yellows, deep blues or sensual pinks! 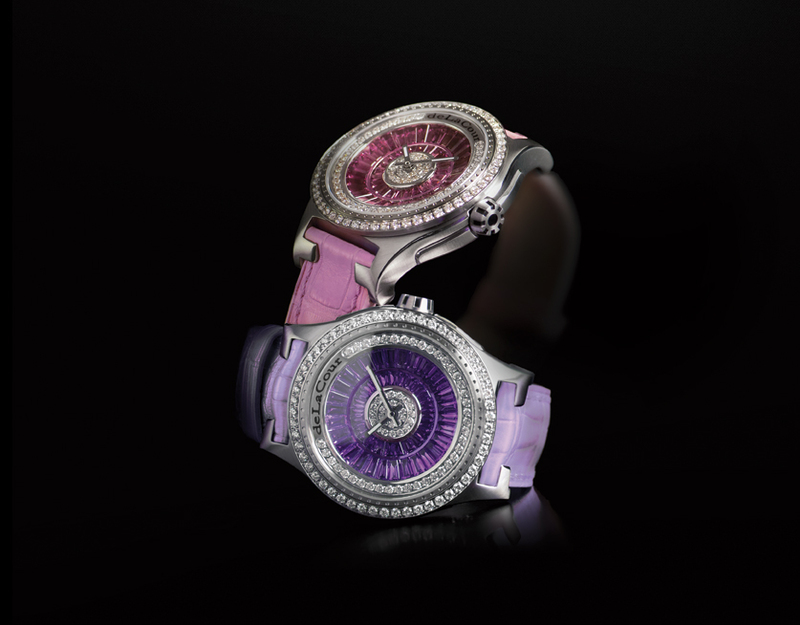 Like an evening dress, the colorful dials are bejeweled with Citrine baguettes, Pink Tourmaline and Iolites. 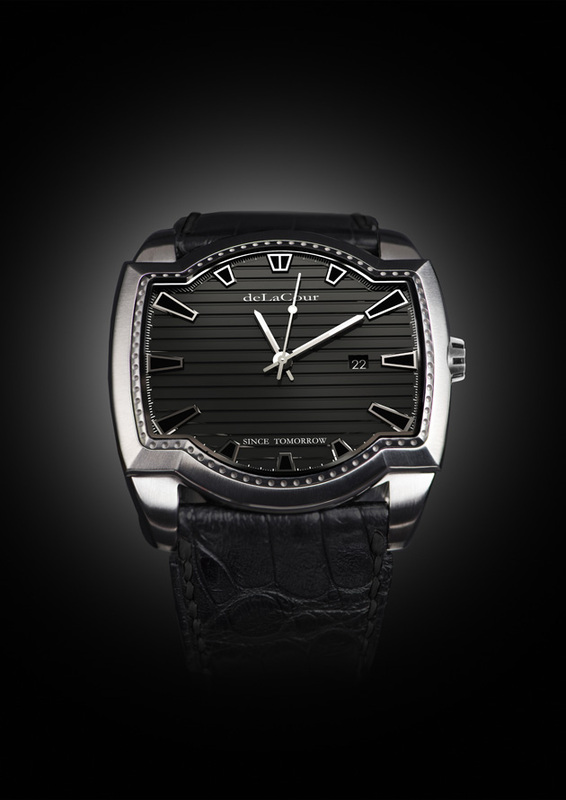 The bezel and the first row in the center of the dial are set with round diamonds tallying no less than 1.88 carats. The Promess Glamour is equipped with a quartz movement especially made for women who like to frequently change their watches. 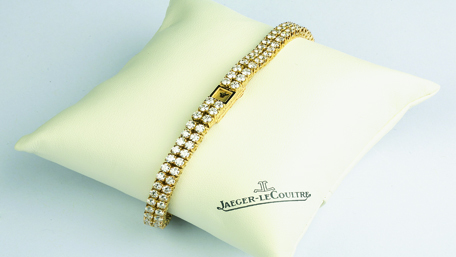 The watch is completed with a hand-stitched crocodile strap matching the color of the precious stones. 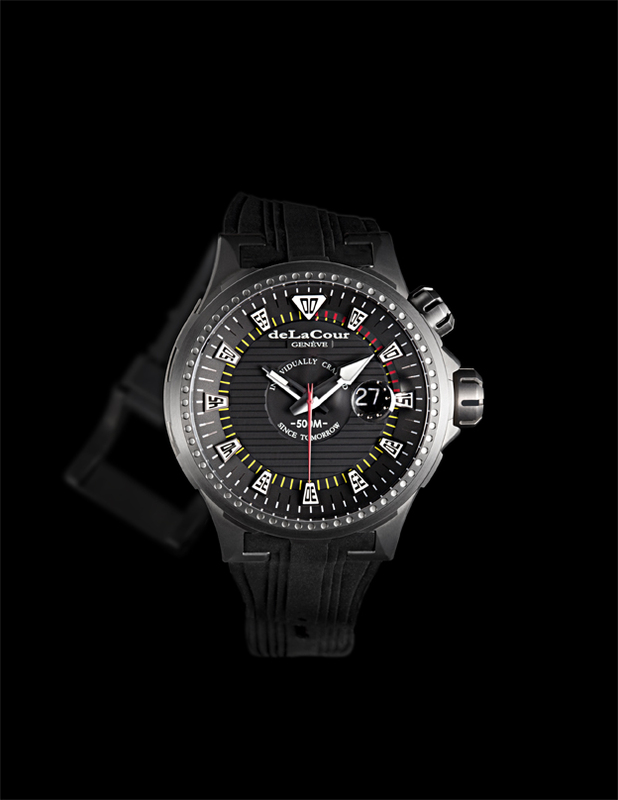 In the sprit of the preservation of our oceans, and sensitive to the degradation of the marine ecosystem, deLaCour created the watch Reef Saver. Unlike the distinct elliptical shape of the brand, this watch is round but features all the deLaCour codes with its folded horns turbine-type crowns. Behind its casual appearance, this luxury “diver” offers accuracy and functionality. Presented in a 48mm diameter titanium case, its strong and powerful lines make this timepiece impossible to resist. The “grade 5” titanium case is a solid and light material that will not tarnish over time. Above all, this alloy is highly resistant to corrosion and will not be affected by the various acids that are regrettably present in our oceans. The black striatal dial features three Superluminova coated oversized hands and hour indexes, which offer precise and fast readability. In order to preserve the case’s water-resistance up to 500 meters, the watch is equipped with a screw-down crown that allows the setting of the hours and minutes. 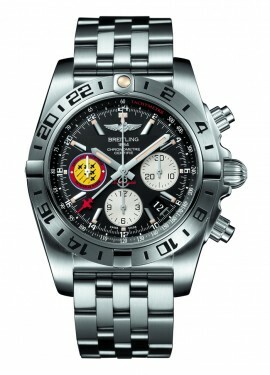 The watch is equipped with an automatic movement. A 100% natural rubber strap with a titanium buckle completes the timepiece.